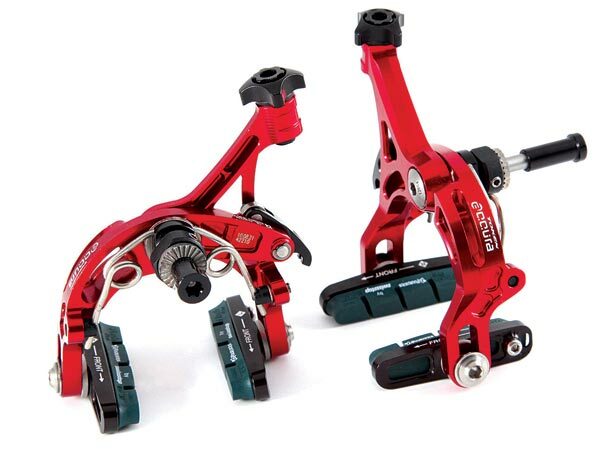 I once had an argument with another rider about whether it was nuts to fit calipers that barely stopped you, just to save a massive chunk of weight. That was indeed the dilemma facing many of the early CNC’d lightweight cam caliper designs. No longer is that the case. Our Token BR7230 Accuras with titanium hardware weighed in at 201g complete, knocking nearly 100g (that’s a sniff under a quarter of a pound) out of the weight of Shimano’s Dura-Ace. But the crux was in the performance. The Tokens, fitted with the supplied SwissStop Flash pads, performed superbly. Very little flex can be felt through the cam – a common concern with this style of caliper – providing a very solid and reassuring feel with excellent stopping power on tap.